If you can think back through the mists of Trump time, before Kanye and Khashoggi and even Kavanaugh — a whole couple of weeks back, even — you might remember what was, for me, one of the most cathartic moments of the Trump presidency. 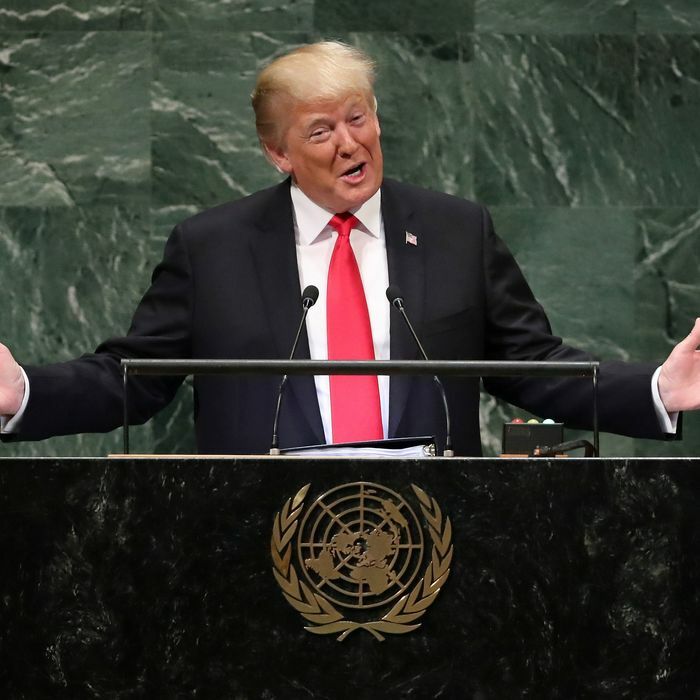 There the president was at the United Nations, breathing heavily through his nose, crooning in that strange mournful cadence of his to convey some sense of gravity as he squinted at the teleprompter. He droned on, sighing almost, as if he were bored with saying it: “In less than two years, my administration has accomplished more than almost any administration in the history of our country, America’s — so true.” And they laughed. As well they should have. It’s a preposterous claim by a preposterous figure. Why don’t we laugh at him? Why does no interviewer simply burst into giggles when he unveils his latest absurd fib? And yet there comes a point at which laughter begins to falter, under the simple, steady weight of events. As I’ve noted before, Trump’s record as a force of destruction is profound, whether it be the sabotage of Obamacare, the devastation of democratic norms, or the rattling of NATO. But as the months tick by, there’s a decent case that Trump’s proactive accomplishments are beginning to add up as well: a huge tax cut, two Supreme Court justices, wholesale deregulation, renegotiation of NAFTA, isolation of Iran, and a broader reboot of bilateral nationalism on the world stage. But I’m not talking merely about policy — he has also shifted the entire polity more decisively toward the authoritarian style of government. In this respect, yes, the Trump administration has indeed accomplished much more than many of us want to believe. The addition of Brett Kavanaugh to the Supreme Court is the latest “win.” The successful nomination — however tortuous, however unpopular, however saturated in drama — achieved several things at once. First, it justified the evangelical and pro-business right’s Faustian bargain with Trump. Along with Gorsuch, Kavanaugh cemented a 5-4 majority for the right on the court for the indefinite future — more quickly and decisively than any Republican had hoped for. If Hillary Clinton had won the presidency, in stark contrast, we’d be looking at a 6-3 liberal tilt by now. That’s a huge, huge payoff for what looked at one point like a major gamble for establishment and religious Republicans — and there could be more vacancies ahead. Second, it showed that the broader Republican coalition isn’t completely dead. The over-the-top tactics of the Democrats and the mainstream media in turning a Supreme Court hearing into an epic battle in a newly energized gender war may have riveted Democratic women and galvanized a younger generation … but it also brought moderate Republicans and Trumpers together again. When confronted with the rhetoric and ideology of the social justice left, NeverTrump conservatives came temporarily back to the fold. I felt it happening to myself. Worse, there was evidence that some of the culture war issues the Democrats are relying on may not be so win-win. Yes, a focus on sexual assault and harassment in the workplace and elsewhere is important in its own right — and it strongly resonates with suburban women who may decide the midterms. But it can also energize conservative and moderate women in defense of what they see as threats to their own husbands and sons; it can further alienate more traditional working-class men from the Democrats; and it could cement a worrying shift among young white men toward the GOP since 2016. The Kavanaugh-Ford showdown also helped upend the overly simple view that women somehow form a monolithic bloc, all united around “women’s” issues, with those issues being defined by the left. In fact, partisanship and tribe trump gender, and always have. Women are no more a single ideological bloc than men, as a majority of white female voters proved in the 2016 election, when they voted for the gross dude over the feminist icon. (One of the really eye-opening parts of Jill Lepore’s new history of the United States, These Truths, is her account of how indispensable women were to the construction of the conservative movement.) These cultural fights, after all, are dynamic. They can rebound on you. If you’d predicted that the Kavanaugh hearings would have been a net-plus for the GOP a couple of weeks ago, people would have deemed you crazy. Today? Not so much. By November, who knows? Now put this in the broader context of Trump’s sole legislative achievement: his massive, budget-busting tax cut. For many mainstream Republicans, this is what they live for. It will be hard to reverse. Which is to say it’s a further justification for the GOP’s going along with populist authoritarianism. No, the tax cut hasn’t proved an electoral godsend, unless you factor in its positive, short-term impact on economic growth. But it sure has helped reconcile the old GOP to the new one. On the foreign front, the key issue motivating the evangelical and activist right is Israel. And Trump has delivered resoundingly. The embassy move to Jerusalem, the tearing up of the Iran deal, the love-in with the Saudis (even to the point of acquiescing to the likely torture and murder of a journalist), the “peace plan” which would consign the Palestinians to an archipelago of Bantustans, and the additional bullying of the Palestinians (shutting down their Washington embassy; cutting hundreds of millions of dollars in aid, including for hospitals and schools), are all above and beyond any previous administration’s fawning. It’s a neoconservative dream after eight years of Obama. Heck, it’s neocon nirvana. Then there’s simply what hasn’t happened. Last week, the New York Times published an exhaustive, magnificent, detailed evisceration of Donald Trump’s long and outrageous business career. It revealed extraordinary levels of tax avoidance and outright fraud; and it demolished the central argument of Trump’s own career and candidacy — that he is a brilliant, self-made man. The populist striver, the tribune of the little guy, this marvel of American meritocracy, was earning $200,000 a year as a 3-year-old. More to the point, his entire business was propped up by daddy for as long as daddy was alive. We knew some of this already. But this was the definitive demolition of a myth that had made Trump’s presidency possible. And nothing happened. No one cared. The polls budged not an inch — and in fact, showed a small boost for Trump. Yes, the news cycle was dominated by Ford-Kavanaugh, but still. This kind of takedown should take over any news cycle. And yet it is now as distant a memory as that once world-stopping op-ed by an anonymous senior Trump official in the New York Times. It makes you wonder whether the possible eventual publication of Trump’s tax returns — even if they are riddled with corruption and impropriety and illegality — would make any difference either. In a liberal democracy, the press is supposed to be a key player in holding the powers-that-be to account. And here you had the best newspaper in the world, dismantling the central myth of a presidency in a Pulitzer-worthy investigation … and it made not the slightest difference. We’ve also seen the rather successful reframing of the Mueller probe. Trump’s absurd counter-narrative — the real collusion was between the Clintons and Russia! — has given the right some way to handle the reality of an otherwise disastrous scandal. Missteps by McCabe and Strzok and now Rosenstein have been exploited mercilessly. The shock, moreover, for the rest of us, has worn off, and the accumulating details and countless subplots have blurred the picture. Mueller will likely give us nothing before the midterms, and Trump has already signaled that he will try to get a new attorney general thereafter, when the probe could get downsized, or simply withstood — or even leveraged for political gain in the 2020 campaign. The Republican senators likely to be elected this fall will, if anything, be even more pro-Trump than their predecessors. Corker, Flake, McCain: all gone. The House GOP will have been transformed more thoroughly into Trump’s own personal party, as the primary campaigns revealed only too brutally. And if by some twist of fate, a constitutional battle between Congress and president breaks out over impeachment proceedings, Justice Kavanaugh will be there to make sure the president gets his way. All of this is far, far more power for Trump than any of us would have predicted, say, three years ago. There’s a new essay in the New York Review of Books, called “The Suffocation of Democracy.” It deals at some length with the parallels between the disintegration of the Weimar democracy and ours. No, it’s not a Hitler analogy, but it is an insight into how liberal democracies fail, from a historian of the Nazi era, Christopher Browning. What Browning understands is the critical role that traditional conservatism has historically played in the construction of authoritarianism and fascism. Because the old-school GOP agenda — massive tax cuts for the wealthy and ending affordable health insurance for millions — cannot get support on its own, they have hitched their wagon to someone who commands the masses through rank populism. But the risk — as occurred in 1930s Germany — is that the pawn can become the master. [McConnell] stoked the hyperpolarization of American politics to make the Obama presidency as dysfunctional and paralyzed as he possibly could. As with parliamentary gridlock in Weimar, congressional gridlock in the US has diminished respect for democratic norms, allowing McConnell to trample them even more. This is the Erdogan model; the Orban example; it could well be the Bolsonaro formula in Brazil. It retains the trappings of a liberal democratic system, while gutting its core principles in favor of a strongman. It is entrenching itself more deeply here. And it is no laughing matter. There are a couple of arguments in Reihan Salam’s refreshing new book on immigration policy, Melting Pot or Civil War?, that seem to me worth more attention. The first is the simple challenge of whether we should continue with our largely family-based immigration system, or move to one that includes a hybrid of family-based and merit-based systems, like Canada’s or Australia’s, which determine immigration partly on the basis of skills. What matters here, Salam argues, is not some epic moral argument about whether we favor immigration in general, whether we’re open-minded or blinkered xenophobes, but a simple economic one, depending on historical context. In the past, the U.S. has been plenty capable of finding jobs for masses and masses of unskilled workers, huddled and unhuddled. It was the American genius. Indeed, for much of our history, unskilled immigration was a spectacular engine for an emerging, racially diverse and integrated middle class. It was a mechanism in which uneducated immigrants could find jobs, prosper, move up the ladder, integrate into the melting pot, and see their kids do even better. But when the economy no longer rewards low-skill labor, when automation and globalization and offshoring have in fact made it harder and harder to do well as a manual worker in the U.S., the equation surely shifts. And that’s what has happened in the last few generations, as technology and trade and cheap travel have revolutionized the world. What you’re doing by sticking with the current immigration system in such an economy is creating a permanent pool of unskilled, poorly paid workers who cannot get ahead very easily. Worse, this class of workers — by virtue in part of its sheer size — will be more likely to form homogenous ethnic enclaves, will be less capable of integrating through the workplace, and be more easily exploited. They could be stuck in a poverty trap defined in part by their ethnicity for quite some time. One of the major recent studies of immigration found that “of the children of foreign-born parents with less than a high-school education, only 6.2 percent will graduate college.” In an economy that increasingly rewards education, that’s a recipe, Reihan argues, for compounding racial inequality and resentment. Which makes our tribal divisions even deeper and less resolvable. Then he makes a point I’ve long tried to explain (and he does it much better). Let’s say you’re an enlightened liberal who is rightly worried by the racism that seems to be endemic to human nature and are appalled at how it has flared up so menacingly in the wake of mass immigration in the last few years. You tend to think that America’s history in particular proves how destructive and resilient this racism is, and how complacency is never warranted. In fact, this backlash has helped propel a dangerous authoritarian to the White House and to empower rightist populists across Europe. It is obviously undermining liberal democracy everywhere. So what do you do in response? Maybe this Democratic consensus makes sense as a moral position. I understand the need to oppose rather than appease racial animus. But as a pragmatic and political move, it seems to be exacerbating the very problem it is seeking to solve. I’ve finally found my own tribe! I’m in the “Exhausted Majority.” That’s a formulation devised by a very large study published this week, called “Hidden Tribes: A Study of America’s Polarized Landscape.” That majority lies between the quarter of Americans who see themselves as “traditional conservatives” and “devoted conservatives,” and the 8 percent who identify as “progressive activists.” And this exhausted cohort, it turns out, hates political correctness. A full 80 percent, no less, see it as a problem in America, and this finding shows no salient age or racial differences. Even the young are fed up, including 74 percent ages 24 to 29, and 79 percent under age 24. What they mean by PC seems, in this study, to be the fear of being “called out” for saying the wrong thing, usually around race and gender. Yascha Mounk writes up the study here and notes one 57-year-old’s worries: “The way you have to term everything just right. And if you don’t term it right you discriminate them [sic]. It’s like everybody is going to be in the know of what people call themselves now and some of us just don’t know. But if you don’t know then there is something seriously wrong with you.” That seems about right to me. The policing of speech under threat of social ostracism is never fun. It constrains speech, it sees evil where there often isn’t any, it conflates mistakes with malice, and it exacerbates racial tension, rather than alleviating it. One might be forgiven for thinking that “wokeness” is, in fact, a mere virtue signal among the white upper classes in their own struggle for power and influence among themselves. Imagine that.